The American Civil Liberties Union is suing the sheriff of Culpeper County for cutting a deal with U.S. Immigration and Customs Enforcement or ICE. The case could discourage other sheriffs from enforcing federal immigration law. 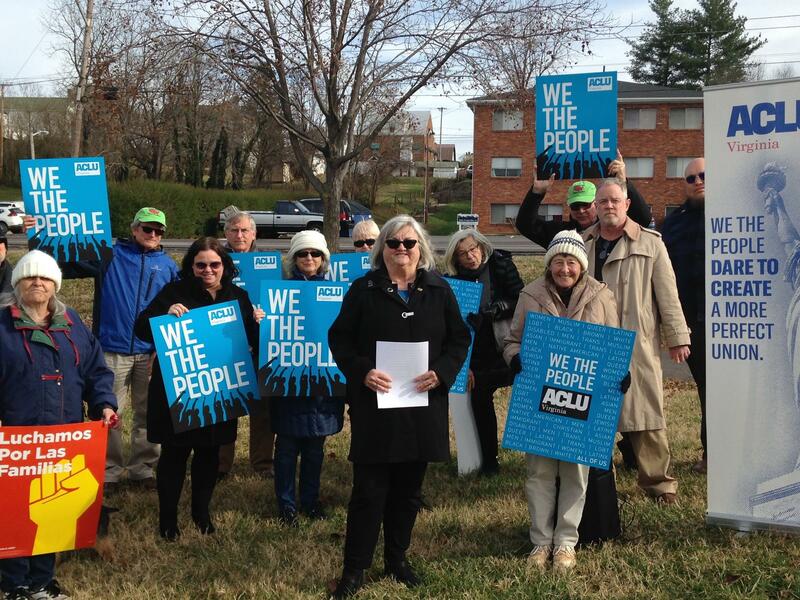 Claire Gastenaga, executive director of the ACLU (center), poses with partners and supporters of a lawsuit against the Culpeper County sheriff. For many years, ICE has asked local sheriffs to question the people they stop or arrest about their immigration status, and if they’re in violation of federal law, to lock them up, but the ACLU says sheriffs don’t have the legal right to do that in Virginia. “Neither our current laws nor the constitution currently authorize any locality or any constitutional officer to take on the responsibility to enforce federal civil immigration laws directly or to spend local tax revenues to do so,” says Claire Gastenaga. executive director of the Virginia ACLU. She and her allies persuaded other sheriffs not to make deals with ICE. The ACLU argues that immigrants, regardless of their status, are less likely to cooperate with police or sheriffs to prevent or solve crimes, because they fear deportation. Gastenaga can’t say how many people are being held in Culpeper County for immigration violations, because the sheriff won’t provide that information. One of the largest and most respected law firms in the state – McGuire Woods – is providing free assistance to the ACLU, and Gastenaga says they’ll ask the court to decide quickly.